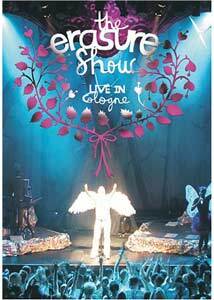 All this time still falling out of love"
Recorded in March 2005 in Cologne, this live disc has the aging boys of Erasure on tour to support their recent Nightbird release, which was intended to be a return to their bubbly 80s synth pop glory. Vocalist and general bon vivant Andy Bell and multi-instrumentalist Vince Clarke do cover their major hits here�including a surprise cover of Blondie's Rapture�but a good chunk of the set has them hitting the key notes from their new disc. Bell does his typical numerous and very extreme costume changes, proudly parading Erasure's techo-flamboyance with a boldly unbridled and frothy excess. There has generally been a giggly nightclub charm to their best work�such as A Little Respect�with dance heavy beats recalling Clarke's Yaz and Depeche Mode days, mixed liberally with more than a nod to the sugary gloss of Abba, though for some reason their Voulez Vous/Take a Chance on Me/S.O.S. tribute is absent here. But isn't just some of their signature renditions that are bypassed here, and the Nightbirds tour was a dramatically more stripped down overall performance, a big step down from the over-the-top early 1990s tours. From the gloomy tree branch backdrop, Bell and Clarke's attempt to revisit their musical roots has a strange, forced feel to it, even though the crowd is noisy and appreciative. Clarke, typically the onstage recluse, has a more forward role on stage this time, even strumming a guitar as opposed to just tweaking knobs. Yet Bell�even decked in feathery angel wings�doesn't look like he's enjoying himself as much as he once did, though his voice still seems to pack the same range as he did in the past. I don't necessarily think it's a matter of just going through the motions, but there is something just not right with this set that I can't put my finger on. The level of emotion seems glaringly absent from Bell, and as the supposed flashy frontman that tends to diminish the luster of the entire show. Songs like Blue Savannah and Oh L'Amour are still terrific little dance/pop confections, but this Nightbird tour (or at least the one performance captured here) reveal a dull kink in their feather boa armor. Image Transfer Review: This 1.85:1 anamorphic widescreen release from Mute is mediocre at best, a 16x9 enhanced transfer full of noticeably soft edges, murky blacks and somewhat muted fleshtones. Part of the blame may fall on the stage lighting, but the transfer just comes across too dark, especially Vince Clarke and the two background singers. Even during songs featuring bright lighting, Andy Bell's skin has a peculiar and unnatural sheen to it. Audio Transfer Review: The audio side fares slightly better, with choices in either PCM 2.0 Stereo or Dolby Digital 5.1 surround. No complaints from the PCM track, which is deceptively full, but the 5.1 track is the preference. The mix here offers a dramatically more pronounced separation between the music and the audience, with eager crowd sounds rising up out of the rear speakers. Sub activity is moderate, but not nearly as dominant as it could have been. Extras Review: Extras include three additional live performances�Into My Arms (03m:20s), Make Me Smile (03m:54s), Piano Song (03m:27s)�recorded in Copenhagen on 06/09/03, available in 5.1 Dolby Digital Surround or PCM 2.0 stereo. Making Of Live In Cologne (05m:16s) has a brief interview with Andy Bell and Vince Clarke, talking about the need to hit the gym before hitting the road, interspersed with backstage and rehearsal footage. Interview (16m:14s) has the boys answering a smattering of questions, such as the best thing about being on tour and what technologies they use to create their live sound, while Live In Cologne Time Lapse (03m:24s) presents venue setup on through the concert in fast motion, and in less than 3 1/2 minutes. The extras wrap with a set of three music videos for the songs Breathe (03m:54s), Don't Say You Love Me (03m:50s) and All This Time Still Falling Out Of Love (04m:20s). The disc is cut into 25 chapters. An Erasure show is always a fairly flamboyant experience to take in, and this live set from early 2005 is no exception. The songs are hook-filled, there's plenty of gaudy Andy Bell costume changes here, but the energy level of the group for this show seems somehow lacking, and is far less effusive and seemingly more robotic. The image transfer is just fair, which only compounds the presentation issues.